Height 1" groundcover Spacing 1" - 2"
HABIT: Colorful groundcover that spreads aggressively and has yellow rosy and red foliage color in full sun. Bruised foliage smells like citrus. Native to Japan. Dies completely away in winter. CULTURE: Can take any soil condition but does best in wet or boggy soil. A nice surprise - it loves wet feet. Zones 4 - 11. 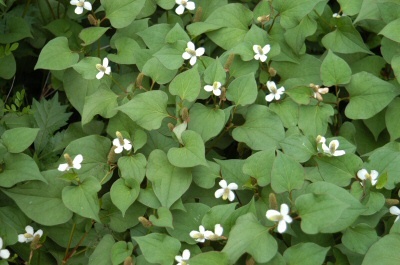 USES: Groundcover for poorly drained areas. PROBLEMS: Needs to be contained. Is very invasive.